We’re sure that your mother is one of the most important women in your life. If that’s the case, you’re probably already looking for unique gifts for mom. Mother’s Day is an annual holiday honoring the mother of the family. It’s also honoring maternal bonds and motherhood in general. The holiday is celebrated all over the world on different dates depending on the country. In the USA, Mother’s Day celebration begun in the 20th century and it was founded by Anna Jarvis. When is Mother’s Day in the USA? Mother’s Day is celebrated on a different date each year. Precisely, it happens annually on second Sunday each May. On this day, you’re supposed to honor your mother first, as well as all other mothers and their significance on the society.If you wonder when Mother’s Day 2019 is, the answer is on May the 13th. 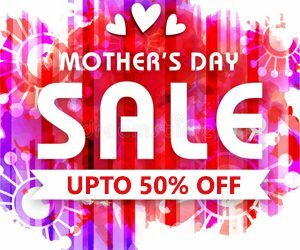 Get Updates On Best Mother's Day Deals! You will receive pre-order details and the best Mother's day Day deals as soon as they're available. Generally, you can celebrate and honor your mother any way you want. Still, some countries do have traditional ways of spending Mother’s Day. You should let your mother sleep in, bring her breakfast and coffee in bed or where ever she wants. Also, make sure it’s her favorite breakfast. Ways to spend Mother’s Day are many, and best is to let your mom choose what she’d like to do on that day. Shopping – almost all mothers will enjoy a day of shopping. Take your mom to her favorite store or mall and let her try on all the stuff she likes. Of course, it would be best if you’d pay for her stuff otherwise the point is somewhat missed. Wine tasting – if your mama is into wine, there’s hardly a better activity idea for her. If you’re in the USA, Napa Valley would be ideal, though you can research your nearby area and find other popular wine tasting options. Spa day – every hardworking mom deserves a day off, so what better way than treating her to a whole day of relaxation and pampering. Spa days usually include massages, hot baths, mani-pedi, facial treatments, etc. It really is as good as it sounds! Since Mother’s Day date 2019 is 13th of May, you still have some time to decide on what you’d get for your mom. Ideas are endless, but in most cases, the best is to gift your mother something unique and special. Most people worry about the money aspect of gifting, though there are many free Mother’s Day gifts to choose from. Mother’s Day pictures – what you can do is print out some of her best pictures as a gift. Make a photo album yourself and decorate it in colors your mom likes the most. Mother’s Day card ideas – there’s hardly a better selling product on this day than prewritten cards. Some cards come blank so you can actually come up with something to write, which is a bit better idea than the prewritten one. Flowers – the most basic gift to get your mom is a bouquet of flowers. There’s nothing wrong with gifting your mom with flowers, but a nice handwritten note would be nice, too, just to make things a bit more personal. We’ve done some research to find the best Amazon gifts for mothers during the Mother’s Day sale 2018. The ideas are many, so make sure to read through all the reviews to find the gift best for your mom. The two necklaces are ideal for mom and daughter to wear in honor of each other. These are made of 925 sterling silver and can last you a lifetime. 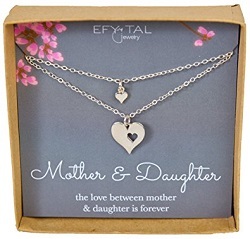 The dainty necklaces are complimenting each other celebrating the bond between moms and daughters. Both are handcrafted in the USA and are nicely wrapped with a card included. The larger chain is 18’’ inches long and fits most women. The smaller chain, however, is 16’’ long and fits most kids. The great thing is that the manufacturer will adjust the length for you if need be and for free. This gift is best for moms who love skincare. Everyone and their mothers know how skin care treatments are a bit costly at salons, which is why this gift would be practical and convenient. The brush helps remove makeup, sweat, oil, dirt, and everything else gathered on our faces throughout the day. 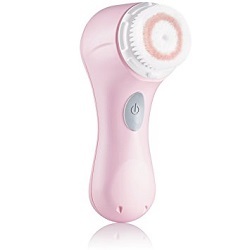 Clarisonic claims that 96% of women who tried the brush experienced smoother skin. Mia 1 is easy to use and will improve your mom’s skin, which is why it’s one of the best gifts you could choose. It’s one of those gifts that you give to your mom, but they end up being beneficial to the entire household. 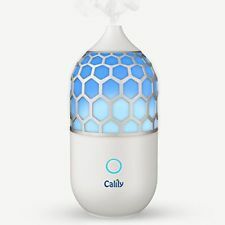 This oil diffuser will allow your mother to relax after a full day of busy city life. The diffuser is inspired by nature and comes in 7 different colors to choose from. 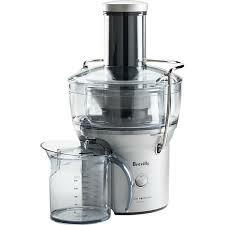 It has four timer settings, and it automatically shuts off when it runs out of water. Your mom can keep it at home or her office as it has changing lighting that creates a relaxing and calm environment. The diffuser has 300ml water capacity and can run for 10 hours straight. However, make sure to point out to your mom that she should only use 100% pure essential oils. Even better, buy a few bottles of different oils and gift them along with the diffuser. Coffee is always a good idea if your mom can’t start her day without it. 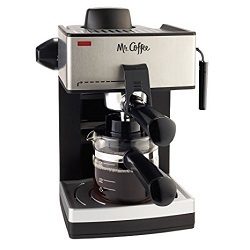 This system features steam heat that delivers rich espresso brew. Plus, its frothing arm makes those rich, creamy froth on top of her coffee. It has a removable and washable drip catches and serves up to 4 shots. The coffee maker comes with instruction on how to attach the filter holder as well as how to use all the features. This is a classic, exquisite gift you can give your mom for Mother’s Day. It has a front ON and OFF rotary dimmer switch and has 12 free dimmable LED bulbs. It has a US standard plug. Your mom can hang the mirror on the wall or attach it to stand depending on her room setup and preference. 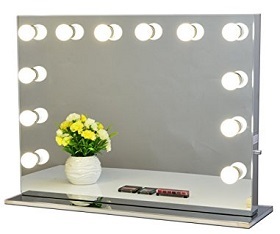 All moms that care about makeup and grooming will absolutely love the vanity mirror. This is a very convenient and elegant gift that’s ideal for many moms. It’s made of leather with synthetic lining. 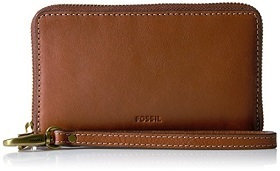 The wallet has a zip closure that’s durable and quality. It’s 4’’ high and 6’’ wide. Your mom can even fit her smartphone in it when she doesn’t wear a purse. It has three interior slips, one exterior and one interior zip, an ID window and three card slots. The wallet is RFID protected. This means it protects your mom’s cards from unwanted scanning while her cards are inside the wallet. It’s impossible to scan any RFID chips that are inside the wallet when it’s properly closed. Another very elegant gift if your mom always wanted a watch but never got around buying one. 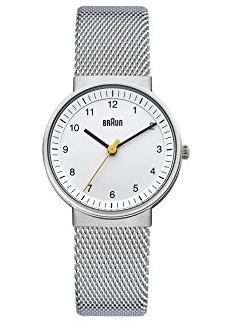 This model by Braun has a stainless steel 33mm case and steel mesh band. The watch is rounded with white dial and contrasting second hand. It also has analog display and Quartz movement. Does your mom have a dog? If so, this is a perfect gift for her. 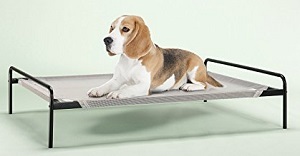 The Zinus elevated bed is 37’’ x 28’’ x 6’’ in size, and it’s easy to assemble. It’s best for indoor use because of its mattress. The mattress is removable and easy to clean. The best is that it comes with a worry-free limited warranty that lasts for a year. This is one of the perfect gifts for mom on Amazon. It’s also beneficial for the entire family. It promotes healthy diet and nutrition, which is always important. The juice fountain has a centered knife blade that’s heavy-duty and durable. Its motor is 700-watts and operates at 14,000 RPM but has a safety locking arm. What’s great is that the juicer won’t start unless it’s covered and safely locked. It has a 3-inch centered feed tube and a stainless-steel cutting disk. Overall, you get 30% more juice and 40% more vitamins. Moms mostly like this because its parts are dishwasher safe and easy to clean up after each use. The juicer also collets pulp that you can use to make fruit jams or marmalades. If you want to gift your mom with something convenient and useful, an armchair table might be the best solution. This one by BW Brands is handcrafted out of solid wood. It’s best if your mom’s furniture has square arms. It’s great for movies nights or when mom is simply watching her favorite tv show. 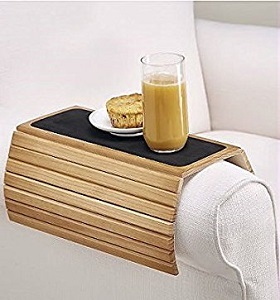 Simply slip it over the armchair and it works as a sofa try. Its measurements are 16.5’’ x 13.25’’ x 5’’. The tray itself is about 6’’ x 13.25’’. Flowers and plants are best-selling gifts on this day. However, gifting your mom with flowers is nice but lacks a personal touch. For some reason, plants are a different story. 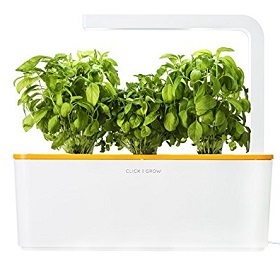 If your mom likes plants and herbs and you want to give her something like that, this Click & Grow kit would be perfect. It’s a self-watering garden that allows your mother to grow her vegetables. The kit is great for indoor use; it’s lightweight and hassle-free. It’s covered by a 100% replacement warranty which means that you can get your money back after 30 days if you’re not happy with it. If your mother is a sporty type and likes her runs and hikes, this might be the best gift for her. It allows her to have enough water wherever she goes. 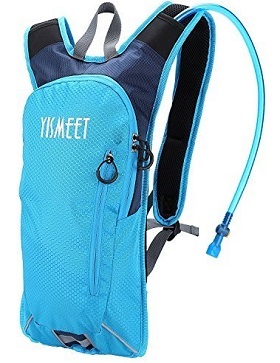 The backpack carries 2l of water along with many other items you’d like to bring along. It’s made of nylon material that’s water and sweat resistant which makes it perfect for long hour walks and running. The backpack is convenient, reliable and durable. The BPA-free bladder keeps her water cool and has a wide screw cap that allows her to add ice cubes. If your mom is into fashion and you want to gift her with an item of clothes she’d wear, this is one of the options. The shirt is made in Turkey and out of 95% cotton and 5% elastane. Its structure is multi-layered, and it fits snuggly. However, the manufacturer recommends that you order a size up from your usual normal size. It’s designed by Tamara Salem and Morf Fashion. Most women like it because it’s easy to pair with different skirts, pants, and shoes. Here’s another great gift for your mom if she likes relaxing and meditating with the help of essential oils. 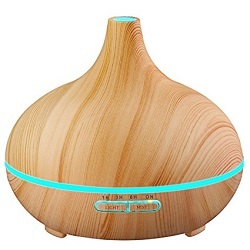 The diffuser uses non-heat ultrasonic waves emitting a mist of essential oils and soft scents. It’s shaped like a honeycomb; it’s pleasant and quiet. It’s great because your mom can put it anywhere she likes. It has an auto shut off button that stops when the tank is empty. With its LED soothing light that changes from one color to another, the diffuser helps you relax after a long and busy day. It covers 250 sq. ft. If you want to be funny and your mom appreciates a good joke, this gift is a good option for you. The ceramic mug has an 11-ounce capacity, and it’s ideal if your mom likes her coffee or tea in a mug. 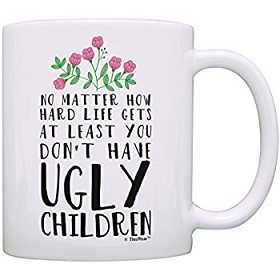 Its funny slogan makes it a perfect gift for moms who drink coffee or tea every day. The imprint is lead-free and safe to use in a microwave and dishwasher. ThisWear coffee mugs are highly popular and one of the best Mother’s Day gifts on Amazon. This is a fun gift that your mother will benefit from. It allows her to print out photographs where ever and whenever. 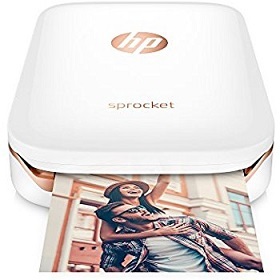 It connects your social media account to the HP Sprocket App via Bluetooth, and it instantly prints photos. The app allows you to customize your pics before you print them out. Besides, the printer is compact and easy to carry around wherever you go. Your mom will love this gift because it’s fun, convenient and easy to use. She’ll finally be able to print out all of your favorite pictures together. 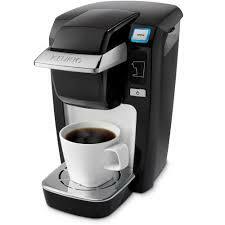 Allowing you to choose from three cup sizes, the brewing system brews different beverages in a few minutes. If you gift this to your mom, she’ll be able to brew things like hot cocoa, iced beverages, tea, and coffee. 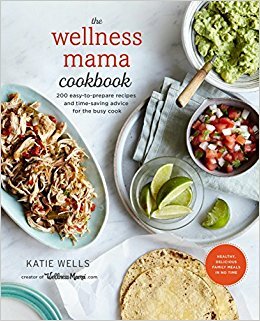 This is the ultimate Mother’s Day gift for many moms who like cooking for their families. What’s best is that all the recipes included are time saving and easy to prepare. It has 200 recipes that are practical and don’t take longer than 30 minutes to prepare. The cookbook is packed with advice on how to stock your pantry. Also, there’s a two-week meal plan as well as shopping lists, and many more tips and tricks. Another great gift for moms who are into fitness, hiking, running or anything like that. 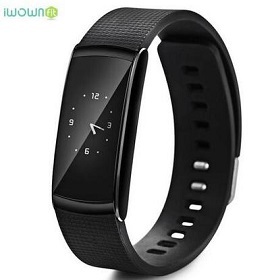 It tracks the heart rate, distance, and steps, as well as how many calories you burn. The tracker also works as clock alarm, allowing you to add schedules and reminds. It’s water-resistant, too, meaning that you can shower and swim with it. This is the best insomnia treatment that’s healthy and helpful. It’s radiation-free and easy to use. 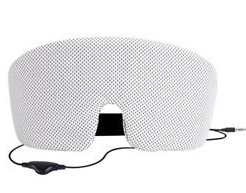 Headphones, eye mask, and audio speaker are all comfortable to sleep with, lightweight and breathable. It’s ideal for a plane and car ride when you need to block out all the lighting and sleep in the dark. Check for the right size before you buy this gift for your mom. The fasteners included are adjustable to allow a better fit all together. If the set doesn’t work for your mother, there’s a free 30-day trial on Amazon Prime so you can return the headphones if need be. To say the truth, whatever you decide to buy your mom on this special day will do the trick. Most mothers appreciate the attention and the fact that you’ve put in some thought. For this reason, you can pretty much give her anything from the list above depending on what would interest her the most. Choose from cards, flowers, mugs, to coffee makers, oil diffusers and much more. Since the day is hugely commercialized, you don’t have to do much work but just hop online and have the gift delivered to your mom’s doorstep.There are many things to choose from, like the Mother’s Day movie on Amazon, candles, photo printers, vanity mirrors and a wide variety of other stuff moms enjoy. Listed above are only some of the gift options to choose from, but don’t forget to consider your mom’s interests. Try and remember if she ever mentioned that she needed or simply wanted to treat herself with something. Also, remember to spoil your mother more than you usually would because the Mother’s Day is all about indulging them. This is a great list for people to use for Mother’s Day shopping. I like the juicer! I love these gifts! Unique but practical. I’m especially interested in the diffuser! What a huge list for Mother’s Day gifting idea. Bookmarking it, as it will be helpful to buy gifts. Love your writing style and some fab gift ideas for Mother’s Day! I’ll definitely try out some of these for my mum. lovely ideas for a timely event. my mom would love the coffee maker. This list is really innovative. I think I should get something from your suggestions. That’s the kind of list I was looking for, since every time I come closer to the mom day I’m so confused! I make her any kind of gift and having new ideas is so hard! !